People often ask me "What is your favorite chocolate?" I responded by sharing lists of highlights for each year, and then further winnowed these down to annual Chocolate Banquet Award winners in different categories. 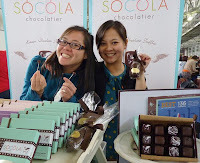 Many highlighted chocolates went on to become Chocolate Banquet Award winners. I also periodically (a few times a year) do Chocolate Challenges, e.g. the most unusual chocolate truffle challenge in April 2011. Because I taste different chocolates each year, and do not repeat (at least not on this blog), these lists are constrained by the fact that I eat a different chocolate each day. I also do not eat flour or gluten, which limits the possible chocolate tasting pool to "only" about 10,000 items. 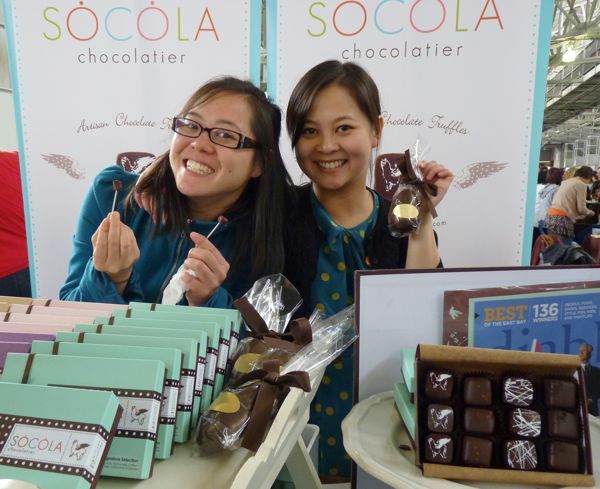 Congratulations to the winners of the April 2011 Chocolate Challenge for most unusual truffle! Recent winners of the most unusual truffle flavors Challenge (from tasting done at the San Francisco International Chocolate Salon, 4/17/2011), included Socola Chocolatier (King of Fruits Durian Easter Egg); Vice Chocolates Sadako Matcha Green Tea and Yuzu truffle; and Amano Artisan Chocolate Yemeni Sidr Honey truffle.